At a tech conference last September, former NYPD commissioner Bill Simmons said that outfitting the department’s entire patrol unit (roughly 24,000 officers) with body cameras would be almost impossibly expensive, costing up to “hundreds of millions of dollars.” But on Tuesday, the City of New York announced just that: Every NYPD officer will have body cameras by the end of 2019. So what changed? Last October, only weeks after Simmons’ comments, the NYPD closed a deal with bodycam maker Vievu: 5,ooo police cameras, plus Vievu’s proprietary cloud storage, for $6 million. The Wall Street Journal reports that the contract also included “options to significantly increase the total number of cameras before the end of the five-year term.” “Significant” is an understatement, with the contract seemingly shifting from 5,000 cameras to more than 20,000. Officers are paid more to wear the cameras, while their representative union, the Patrolmen’s Benevolent Association, dropped pending lawsuits against the NYPD. The PBA previously sued the NYPD to block them from mandating cameras for officers without union approval. Mayor Bill DeBlasio praised the agreement for its purported “transparency,” but it’s still unclear how much the new cameras cost or what funds will pay for the devices still considered controversial by activist and police reform organizations. How’s that for transparency? Body cameras themselves are relatively inexpensive, but cloud storage and (crucially) security measures to protect video footage are a) expensive and b) endlessly recurring. Officers have been caught tampering with and “accidentally” deleting hours of footage. Cloud storage keeps a permanent, unaltered copy and records who makes any changes. 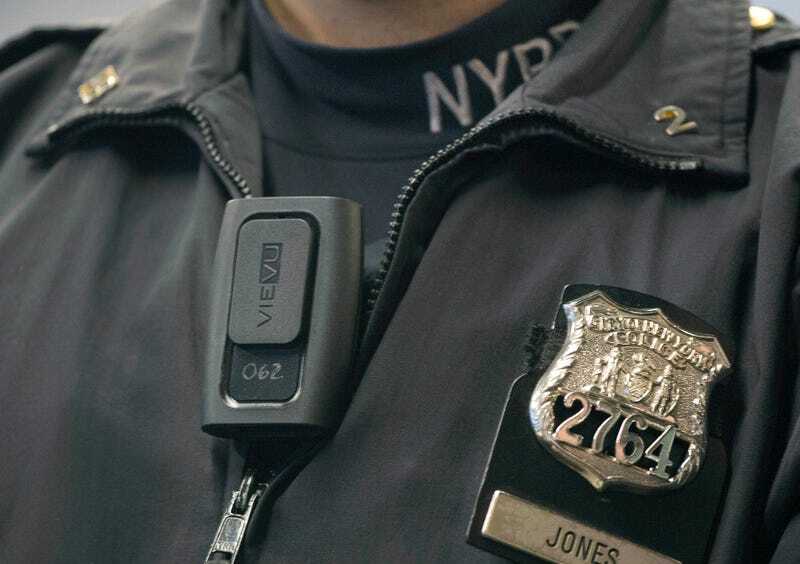 A 2016 report released by The Leadership Conference on Civil and Human Rights reviewed the NYPD’s body camera program and recommended a number of changes. Chief among them were making it easier for the public to request footage related to complaints and making sure officers couldn’t view footage before filing an official request—thus preventing them from tailoring their report to what’s been recorded. It’s not clear how extensively the NYPD will update its cam program, but changes are clearly underway. Not clear what they are, though—the NYPD only referred us to the official statement, while Vievu and DeBlasio’s offices haven’t responded to requests. In the meantime, their next moves, like all of us, are being watched.